Teen driving. It is the key to parental freedom, as well as teens’. No more carpooling, no more arranging your schedules around their practices, rehearsals, or evening plans. It is also a time that can be fraught with second guessing for ourselves and for them. 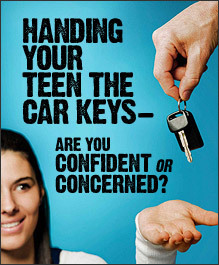 More and more teens are postponing getting their licenses or permits and letting their parents continue to drive them. Our roads are more crowded then ever. Drivers these days have become increasingly aggressive. Teens are smart to want to wait until they feel ready. When they are ready, (and even before) there are some important things for parents to remember. 1- You are their driving role models. This is not a ‘Do as a I say not as I do’ moment. Explain what you are doing and why. Explain why you do things that you don’t want them to do, and apologize when you drive badly. 2- Remember, you can make your own rules that exceed what your state requires. Just because they have hit the right age does not mean they are ready. You decide when they are ready to take their driver’s test. 3- Practice makes better. One Arlington, VA family doubled the pre-license driving hour requirements for their boys. They required highway experience before the license, too. Early Sunday mornings were a good opportunity to try out highway driving. 4- Skills empower drivers. Require that they can drive smoothly in reverse, parallel park, fill the tank, change a tire, and check the oil. Girls as well as boys. The more they know, the more they feel in control and are willing to take control. 5- There should be no crossed fingers at test time. Everyone in your family should know when your teen is ready to become a driver. One mom shared a great link to thinking about teen driving. Check out the CDC’s website and some of the links in the left hand column.